Sometimes being trendy isn't healthy. At all. These days, it's nearly impossible to browse the web without photogenic food popping-up on your social media feeds. And it's usually trendy, indulgent and tempting to try it out yourself, be it a rainbow bagel or even a latte made with broccoli (yes, really). Usually these trendy foods are pretty benign — they just may not taste very good if you make them at home — but the recent recall of a popular blogger's cookbook has many in the social media world realizing that sometimes hip-looking food is downright dangerous. On Friday, Johnna Holmgren, a food blogger and natural lifestyle advocate, saw her cookbook pulled from store shelves over concerns that some of her recipes, which feature wild, foraged foods, posed a potential threat to diners' health. Holmgren, who lives in Minnesota, is known on Instagram as Foxmeetsbear, and shares her “naturer” lifestyle and foraging experiments with 131,000 followers. In May, Holmgren took her wild hobby to a new level and published her first cookbook “Tales from a Forager's Kitchen,” which includes more than “more than 80 recipes and foraging tips.” The book was published by Rodale. Some of her recipes include ingredients like elderflowers in quiche, wild blueberry bee pollen to make scones, wild acorns in pumpkin soup or reishi mushrooms to make special lattes. However, not all of her fans (or even those who had never heard of Holmgren) were thrilled by the foraging-first method. Some readers sounded the alarm over her advocacy of cooking with potentially dangerous, wild-grown ingredients, leading her publisher to recall the volume. “Rodale Books and our author Johnna Holmgren take very seriously the concerns expressed by readers regarding the preparation and cooking of recipes with raw ingredients (mushrooms and elderberries) that are contained in her recently published 'Tales from a Forager’s Kitchen'," Rodale said in a statement. The book is still available on Amazon, where it has received dozens of reviews: about half give the book one star (labeling it "irresponsible" or "dangerous nonsense") while the other half are five-star reviews. “There is a lot of unsafe misinformation in this book as to what is safe to eat or not. These recipes were not well researched or evaluated before printing and could honestly poison you and your family,” said another reader. One of the recipes, Chocolate Dipped Fungi, which calls for raw morel mushrooms, appeared to be especially worrisome as research has shown that consuming raw morels can be toxic for humans. “That's a pretty big no-no. 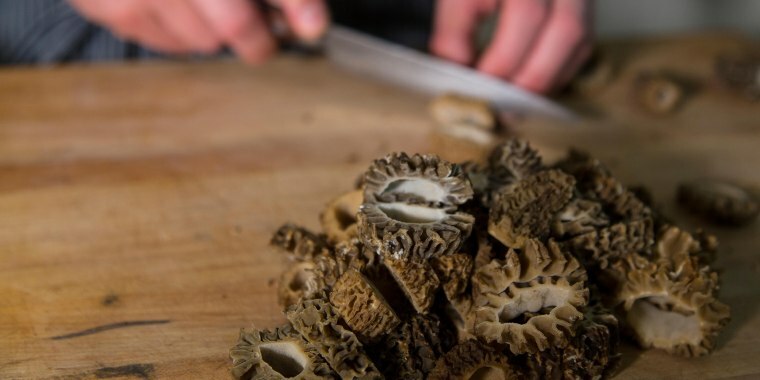 Morels need to be cooked first to be safe for human consumption,” one of the readers wrote. Jeremy Faber, owner of Foraged & Found Edibles and former chef at The Herbfarm restaurant near Seattle, agrees that the concern around the cookbook is well founded. "If you look at toxicology on websites about mushroom poisonings, morels would be the number-one mushroom on there. A lot of people have allergic reactions to them," he told TODAY Food. “I wouldn't promote a bunch of unknowledgeable people doing it themselves. I always tell people, if you don't know how to identify a plant, then don't bother," Faber added. Holmgren’s website contains a disclaimer saying that she is not responsible for any risks that may arise from her suggestions. "While I strive to be 100% accurate, it is solely up to the reader to ensure proper plant identification. Some wild plants are poisonous or can have serious adverse health effects. I am not a health professional, medical doctor, nor a nutritionist. It is up to the reader to verify nutritional information and health benefits with qualified professionals for all edible plants listed in this web site and any published content,” she wrote. In the first edition of the book, Holmgren does provide some guidance for those who are new foraging, adivising, "Be certain that you are 100 percent sure of the species and their identification before consumption. Some species will simply give you an upset stomach, but others, especially in the fungi world, can be so dangerous and their potency so strong that it may lead to death." The publisher is now calling on both readers and sellers to return "Tales from a Forager's Kitchen," and will be "offering a full refund to consumers who have purchased the book."